Her Sunrise Guide helps connect consumers to eco-friendly products and services. Heather Chandler, the founder of the Sunrise Guide and winner of our 2017 Pollinator Award, credits her progressive parents for giving her an interest in sustainability and social justice. She grew up in Northampton, Massachusetts, a town that in the 1970s was “a hotbed of social activism,” Chandler recalled. The family marched and protested as a unit. They fought for women’s rights at “Take Back the Night” marches. They marched for civil rights, with Chandler walking alongside her adopted African-American brother. And they attended gay rights marches with her father, who came out of the closet when Chandler was a year old. As an adult, Chandler has focused her energies on issues of sustainability and everyday environmental activism. Her Sunrise Guide, which celebrated its 10th anniversary last year, is an annual resource guide to eco-friendly businesses from dry cleaners to restaurants. It contains nearly 200 coupons that give discounts on products and services to encourage consumers to patronize these green businesses. The latest edition also includes articles on food hubs and yoga, a listing of farm-to-table caterers, and a guide to pesticides in produce. Chandler said there weren’t many green businesses in Maine, particularly ones that sold consumer products and services, when she started the Sunrise Guide with one full-time (seasonal) employee. 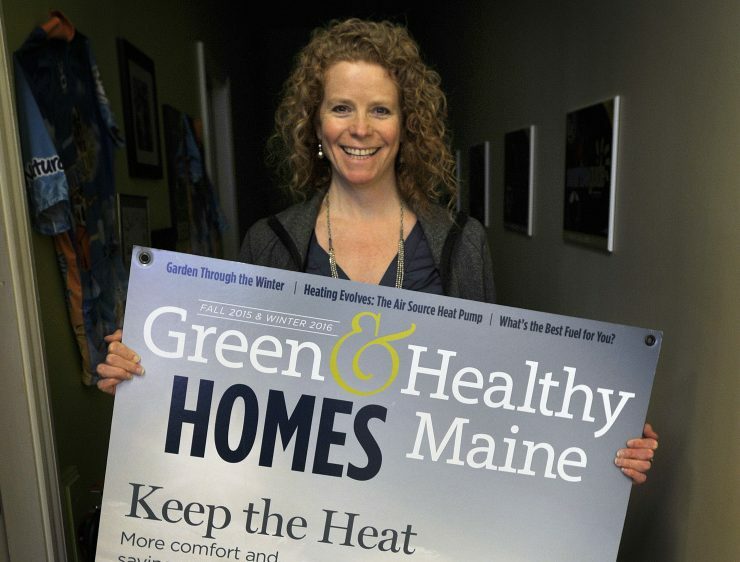 Today she has four full-time employees and has launched a mobile edition of the Sunrise Guide and two new guides – the Green & Healthy Maine Visitors magazine for tourists, and Green & Healthy Maine Homes for people interested in making their homes more eco-friendly, comfortable and efficient. At least five other states have publications like the Sunrise Guide, Chandler said, but she chose to expand her business through the two Green & Healthy guides here in Maine rather than introduce the Sunrise Guide model elsewhere. “I got into the business because I love Maine, and I want to provide these products to Maine,” she said. One of the things Chandler, 45, is most proud of is her role in helping new local businesses get off the ground. “I actually joke that we’re a little bit of a business incubator because several of our former employees have gone on to launch businesses,” she said. Her first employee at Sunrise Guide later founded Green Clean Maine (an eco-friendly cleaner), and the founders of Baxter Brewing and Tortilla Pachangeria also worked at the Sunrise Guide. In each case, they noticed a local niche they thought they could fill.